Take your place on the Rocking Gladiator Joust podium and battle it out to see who is the last one standing. 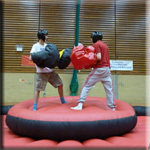 Contestants use oversized foam boxing gloves to try to knock their opponent into the inflatable pit but beware, the gladiator podium will rock from side to side with your every move so keep your balance while trying to battle with your opponent! 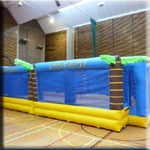 Bungee football is one of our many fun games played within our Inflatable Sports Arena. The concept of the game is the same as football, accept each player is attached to a bungee cord. 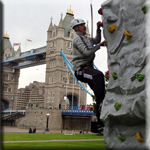 Players are trying to score in their opponent’s goal whilst constantly being pulled back by their bungee cord. Bungee Football is a fun and challenging twist on the sport of football. 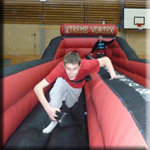 Inflatable Human Table Football is the life size version of the popular game known as Table Top Football (foosball). Players on our Human Table Football (HTF) are attached to a bar, not a rope, which ensures players must work as a team to score a goal! Team work is vital for all players to succeed on our Deluxe Human Table Football. We use aluminum bars rather than ropes to ensure the game potential is maximized and is as true to the traditional table top game as possible. 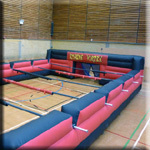 Our inflatable version of this game can cater for ten people at one time, playing a 5-a-side game. The high walls on our inflatable football pitch ensures the ball stays in play for longer and a referee is always provided with this activity. 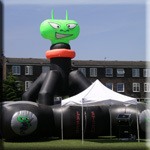 Inflatable Laser Tag is an exciting and challenging non-contact shooting game which can be enjoyed by players of all ages (minimum of 6 years old). 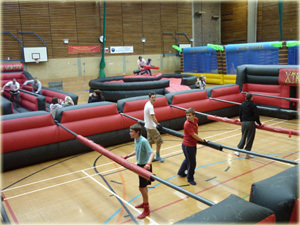 The inflatable Laser Tag game is played inside an arena which can be filled with swirling fog and subdued lighting to create an extraordinary atmosphere. The basic idea of the game, is to achieve the highest score. Take your place on the Rocking Gladiator Joust podium and battle it out to see who is the last one standing. 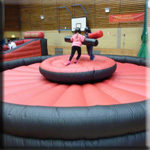 Contestants use foam pugil sticks to try to knock their opponent into the inflatable pit but beware, the Gladiator Podium will rock from side to side with your every move so keep your balance while trying to battle with your opponent!